Whew, last week flew by with barely a chance to blog and looks like this week may be a bit hard too. Before I fly up to Baltimore for work tonight, I wanted to share a quick recipe that we have been loving this winter. Grapefruit is the jewel of the winter citrus family, I'm convinced. Pretty and tart, these beauties are enhanced even further by making a quick trip to the broiler. Cooking my way through Katie Lee's cookbook, I came across this sweet breakfast treat and had to share. Preheat the broiler. Position the oven rack in the top third of the oven. In a small bowl, stir together the sugar and cinnamon. Halve each grapefruit. Using a paring knife, cut around the edge of the grapefruit and between the segments. 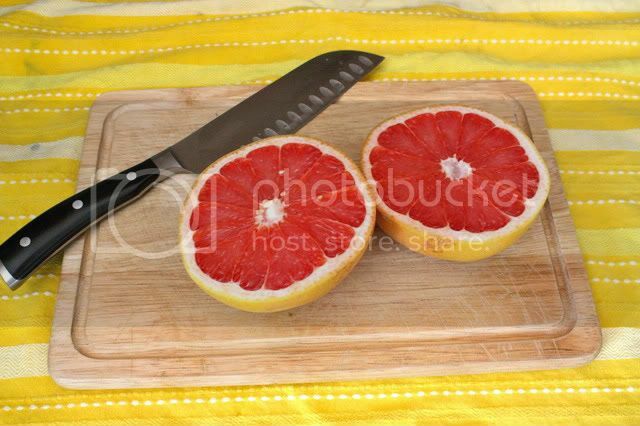 Arrange the grapefruit halves on a baking sheet or broiler pan. Sprinkle the cinnamon-sugar mixture evenly over the grapefruit halves. Place under the broiler for about 5 minutes, until the sugar is golden brown and bubbly. Keeping the oven door open a bit will help prevent burning. Be sure to watch closely, the sugar will burn quickly. Yum. I get satisfaction just from the gorgeous colour. I love the simplicity of this recipe :) Looks great! This sounds yummy...I am going to order extra citrus this week to try it out...thanks. Yum! I'm making this for breakfast night now thanks to this idea! I have a whole crisper drawer full of grapefrutis from my grandfathers trees in Louisiana! That looks delicious! And so simple, might have to give it a try! Thanks for sharing, this sounds so simple and delicious!